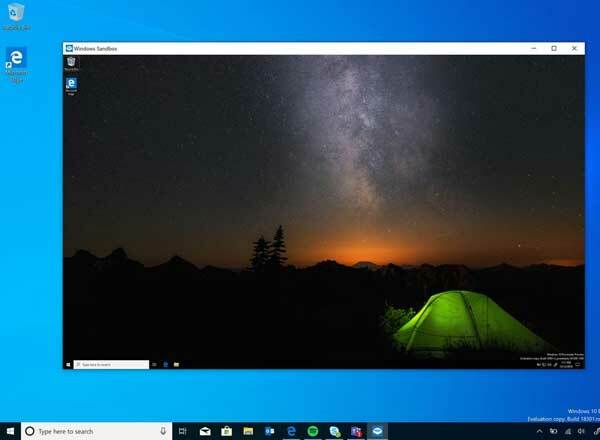 Windows 10 comes with a new feature called “Storage Sense”, which will automatically delete temporary files created by apps and erase old files that have been in the Downloads folder or Recycle bin for over 30 days. If you’re not satisfied with this feature, you can disabled it permanently. 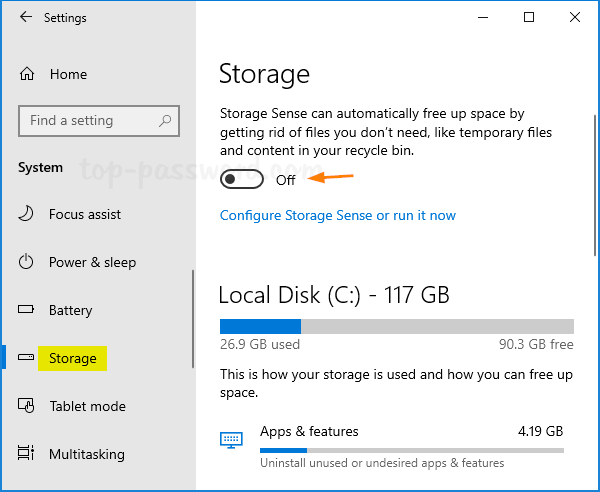 This tutorial will show you 3 simple ways to turn off Storage Sense in Windows 10. Open the Settings app and then click the System category on the main page. Click the Storage in the left navigation menu. You can then turn off the Storage Sense on the right side. Since Storage Sense is turned off, it will not automatically delete temporary files to free up disk space. 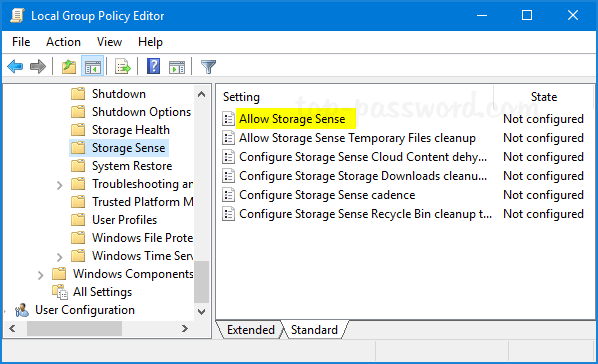 Next, double-click on the Allow Storage Sense policy on the right pane to edit it. 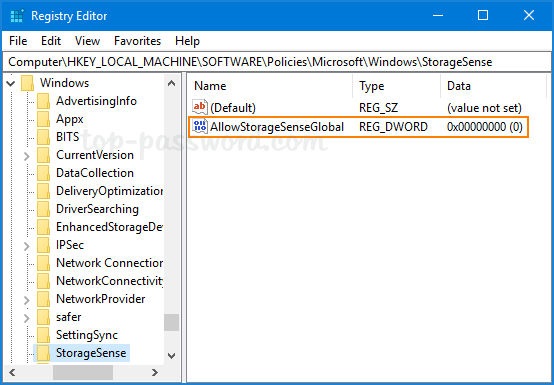 Now you’ve successfully disabled Storage Sense on your Windows 10 PC. 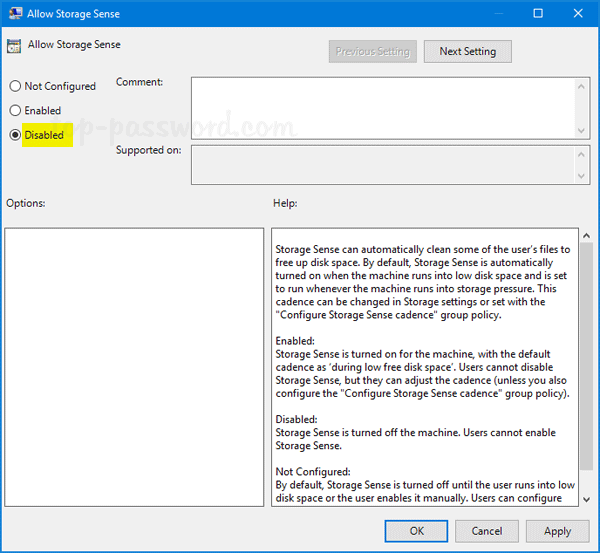 This method will also prevent users from turning on Storage Sense from the Settings app. 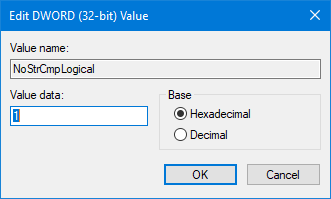 Right-click on any blank area in the right pane, and then select New -> DWORD (32-bit) Value. 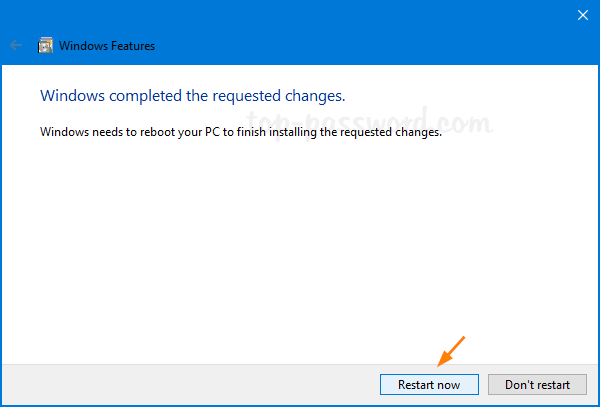 After completing these steps, Restart Windows 10 to apply your changes immediately. 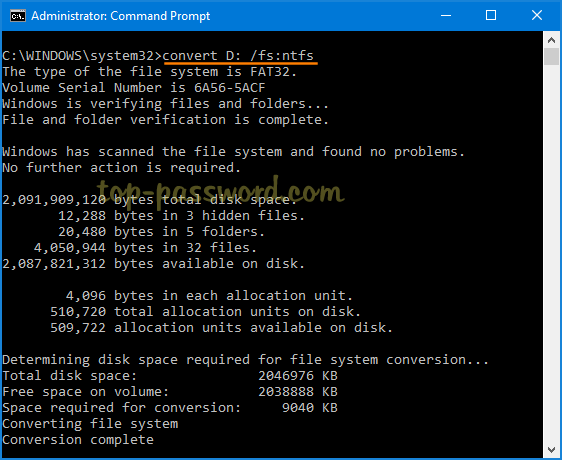 How can I convert a FAT32 volume to NTFS without losing data? Both FAT and FAT32 are legacy file systems and Windows only supports FAT32 partition up to a size of 32 GB. When you try to copy a single file larger than 4GB to a FAT32 drive, you might also get the error “The file is too large for the destination file system“. To fix this issue, you have to convert the file system over to NTFS. 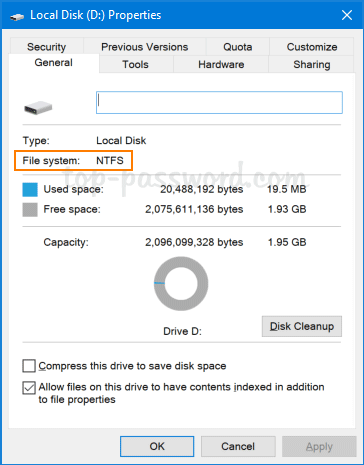 This tutorial will show you an easy way to convert a partition or volume from FAT32 / FAT to NTFS in Windows 10 without data loss. To begin, you need to open an elevated Command Prompt. In Windows 10, just type cmd in the Cortana Search box. 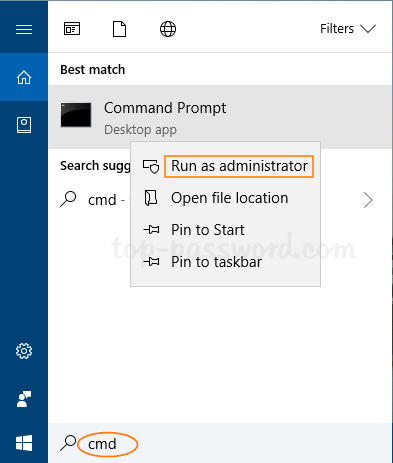 Right-click on Command Prompt in the search result and select “Run as administrator“. Type the command below, and press Enter. You must replace drive_letter with the actual drive letter of the FAT32 / FAT volume you want to convert to NTFS. Before converting the file system, you might be asked for the current volume label of the volume that is going to be converted. The volume label is the name of your drive displayed in File Explorer. When finished, close Command Prompt and you can right-click on that drive to access Properties and check if the file system is already converted to NTFS. So this is how you can use the built-in Convert.exe command in Windows 10 to convert a hard disk or USB drive from FAT32 / FAT to NTFS. Note that this command doesn’t support converting NTFS to FAT32. In order to change the file system of your drive to FAT32, you can move the files elsewhere, then format the drive as FAT32 and move them back. 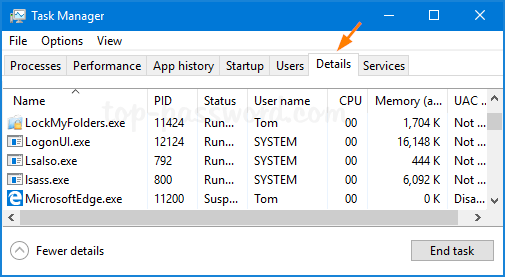 Task Manager lets you gain access to the essential information regarding the running processes and the real-time performance in Windows. Whenever you launch Task Manager, it will open to the Process tab by default. 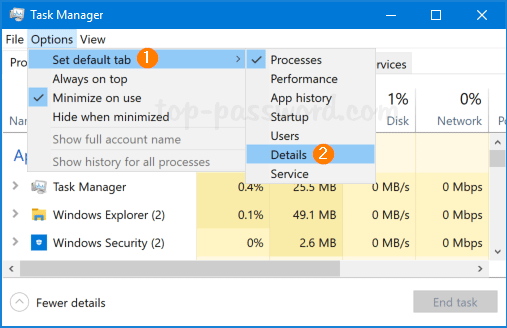 Starting with Windows 10 19H1, you can change the default tab for Task Manager according to your usage habits. 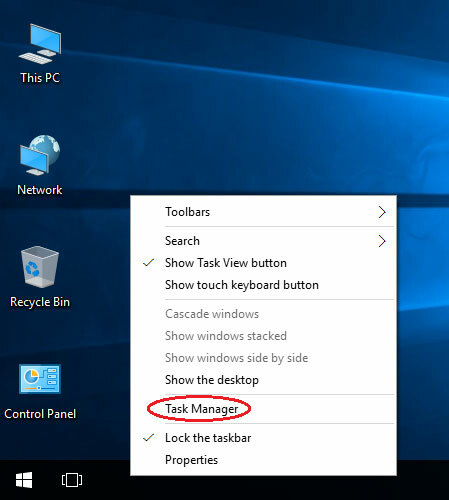 Right-click on the Taskbar at the bottom of the screen and select Task Manager. In the Task Manager UI, click on Options on the menu bar and choose “Set default tab“. There should be a check mark next to your current default tab, and you can change it to other tab like “Details”. The next time you open Task Manager, it will open to the new default tab you set. In the right pane, double-click on the DWORD named StartUpTab to modify it. Enter one of the following values and click OK. If you want to set the “Details” tab as the default tab, just change its value data to 5. Close Registry Editor. Relaunch Task Manager and you can see the change immediately. 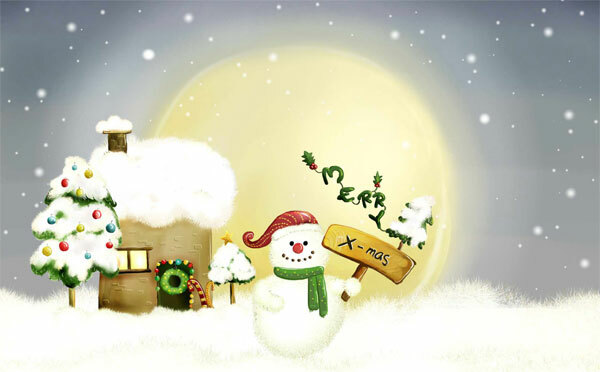 To celebrate this awesome holiday, Top Password Software is offering the largest discount coupon for all our products. Customers can save up to 50% on all our products. This promotion will expire at 23:59 UTC, Dec 31th 2018. 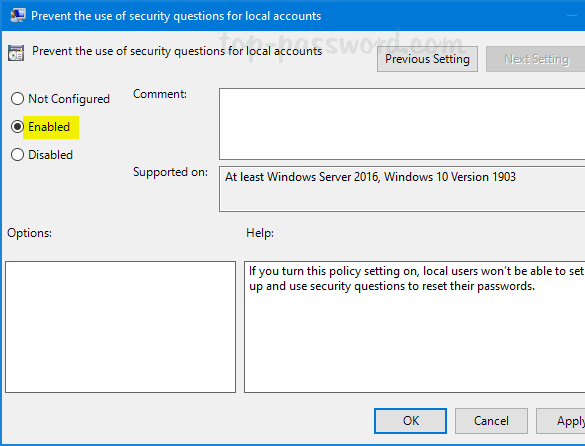 Adding security questions for a local account will provide an extra way to restore PC access if you forget your Windows 10 password. If you think this feature is neither secure nor reliable, you can remove security questions using a registry tweak. 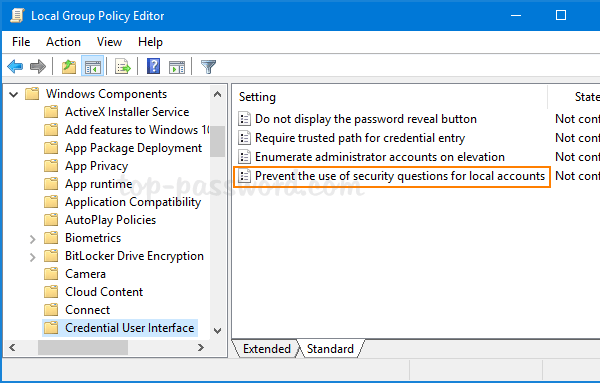 Since Windows 10 build 18237, there is a new group policy that lets you disable / prevent the use of security questions for local accounts in Windows 10. The following methods will prevent users from changing or adding security questions to local accounts. 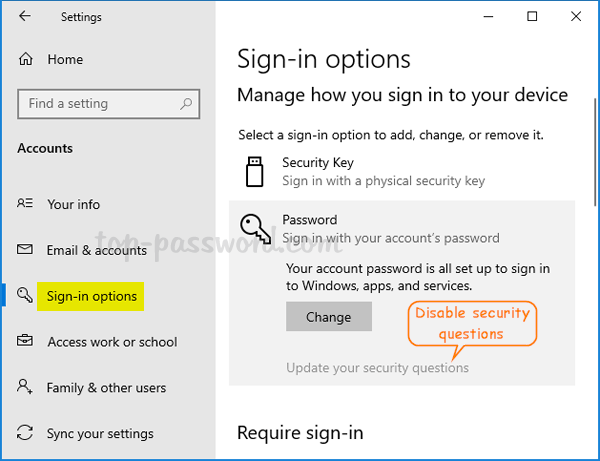 If your security questions are already set up, you’ll be unable to reset forgotten Windows login password by answering the security questions. In the right pane, double-click on the “Prevent the use of security questions for local accounts” policy. 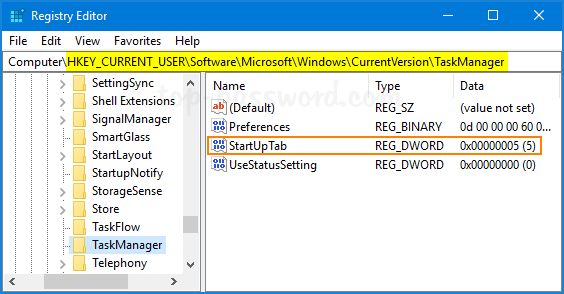 To make this group policy to take effect, you need to restart Windows 10. On the right panel, right-click any blank area and select New -> DWORD (32-bit) Value. Note: if the System key doesn’t exist, you have to create it first. Name the new value as NoLocalPasswordResetQuestions. To disable the Security Questions feature, set its value data to 1. Close the Registry editor. Restart your computer to make the changes take effect. 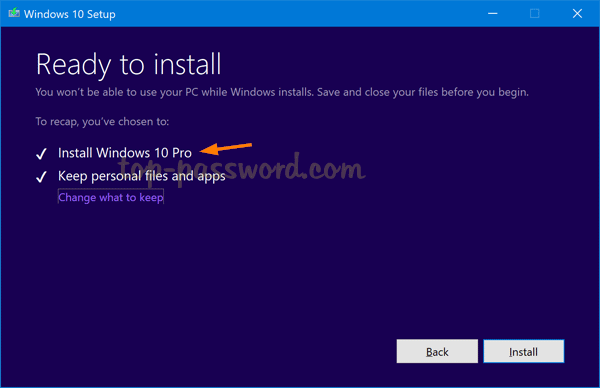 Unable to select Windows 10 Pro edition during clean installation? 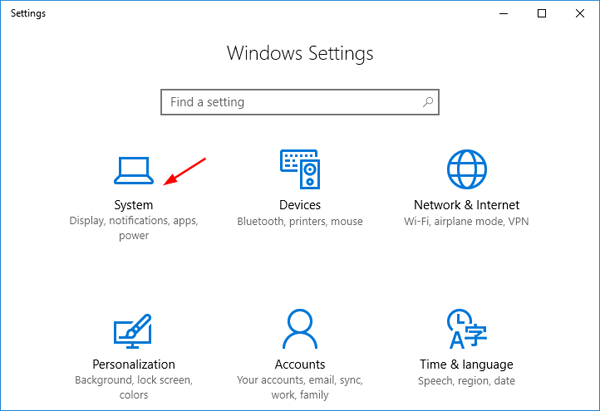 When you try to perform a clean install of Windows 10, the setup process may not give you options to select the edition type (Home, Pro, Education, etc). This problem usually happens on computers that came preinstalled with Windows 10 Home. 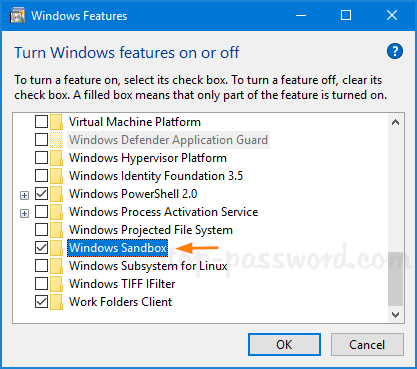 Because the OEM product key is embedded into the UEFI firmware, the installer will detect the product key in the UEFI and automatically select the corresponding edition of Windows 10 to install. 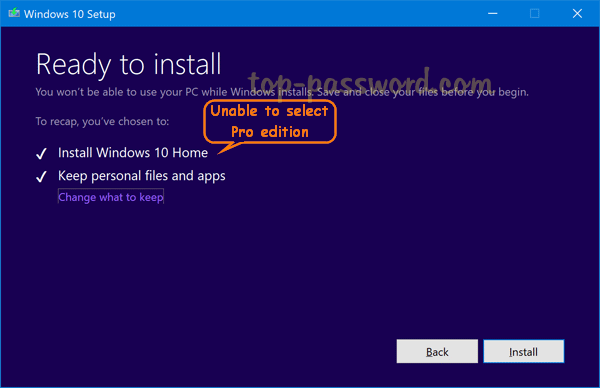 In this tutorial we’ll show you a way to prevent Windows 10 installer from using the preinstalled product key in the UEFI, so you can install the desired edition of Windows 10. To start, use the Microsoft’s Media Creation Tool to download Windows 10 ISO file and create a bootable installation USB. 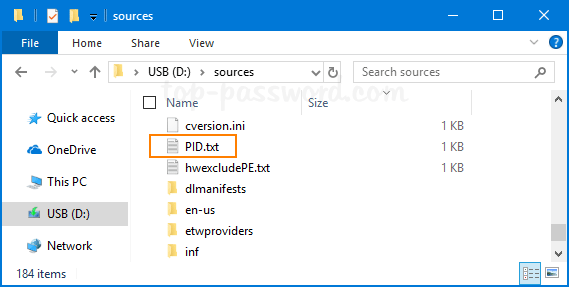 Open the sources directory in your USB drive and create a text file named PID.txt. Double-click the PID.txt file to open it with your text editor (or Notepad). Copy the following lines and paste them. Note: The default product key for Windows 10 Pro is VK7JG-NPHTM-C97JM-9MPGT-3V66T. If you need to install Windows 10 Enterprise edition, use this default key XGVPP-NMH47-7TTHJ-W3FW7-8HV2C instead. These keys are for evaluation purposes and will not activate the system. 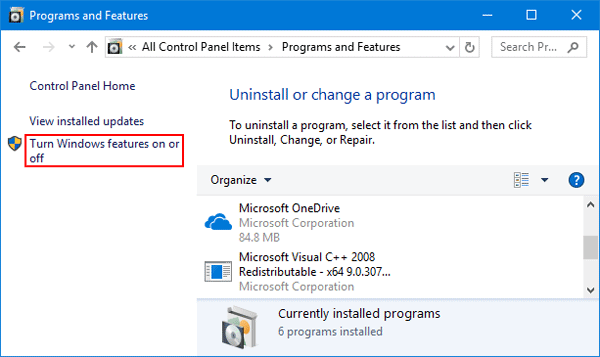 Once you have done this, boot your computer from the Windows 10 installation USB. It will let you install the Pro edition instead of the Home edition. After installation is complete, you have to activate it using a valid Pro key. That’s it! How can I disable automatic sorting in File Explorer? 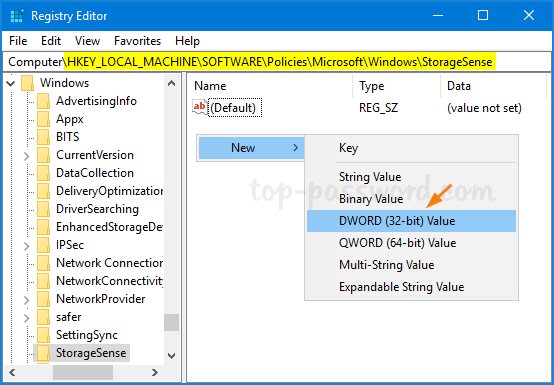 In Windows 10, numerical sorting is enabled by default and file explorer will sort files by by increasing number value (for example, 3 < 22 < 111). 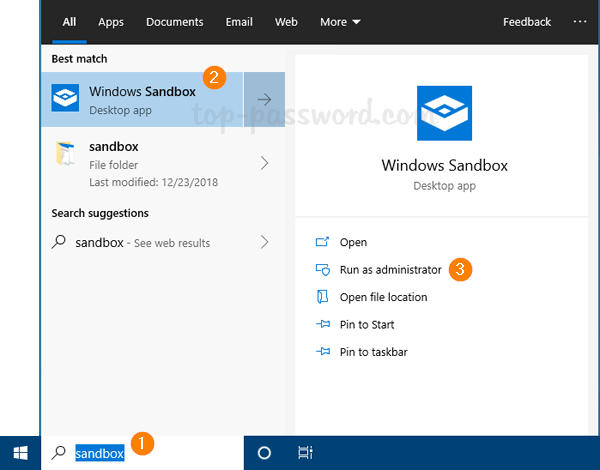 This tutorial will show you how to turn off numerical sorting in Windows 10 so the file names are sorted by each digit in file name (for example, 1111 < 222 < 3). 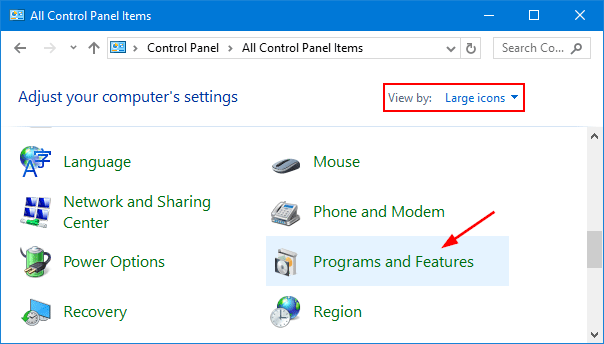 Open the Local Group Policy Editor and expand to Computer Configuration\Administrative Templates\Windows Components\File Explorer. 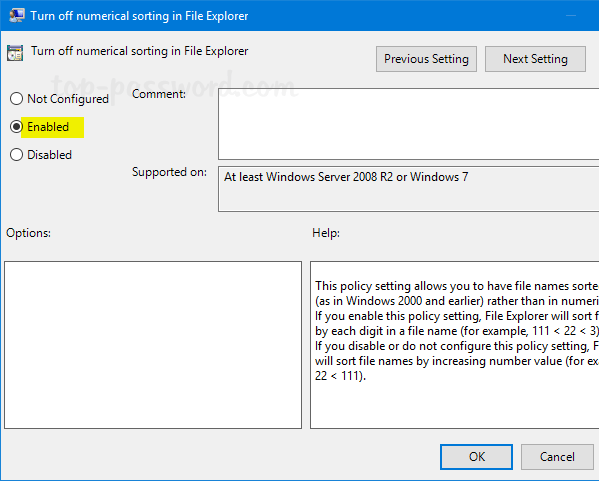 Double-click on the policy named as Turn off numerical sorting in File Explorer to edit it. The changes should be applied immediately. If not, restart the PC or File Explorer. 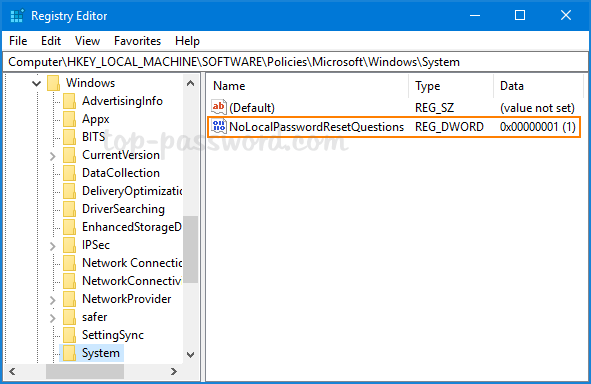 Open Registry Editor and navigate to the key: HKEY_LOCAL_MACHINE\SOFTWARE\Microsoft\Windows\CurrentVersion\Policies\Explorer. 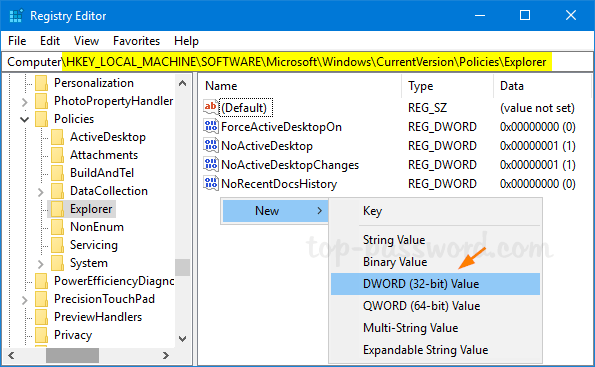 Right-click any blank area in the right pane and select New -> DWORD (32-bit) Value. Rename the newly created DWORD to NoStrCmpLogical. Double-click on it and change its value data to 1 to disable numerical sorting. If you want to enable numerical sorting later, just set the value to 0. Close Registry Editor. After restarting your PC or logging out, File Explorer should sort your files by digit and not by numbers. Is there a quick way to copy the file path instead of typing it? Just right-click on your selected file and select Properties from the context menu. 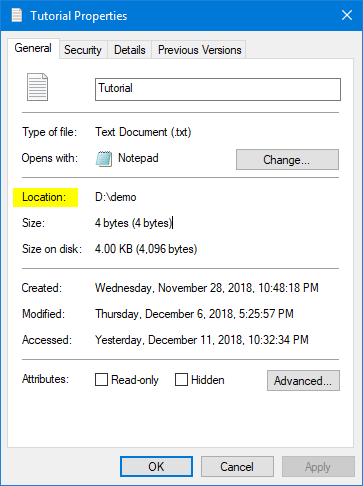 The path is shown next to the Location header, and you need to append the file name at the end to get the full file path. However, this method has inherently low efficiency, especially if you need to frequently copy the file path and paste it into a tool like Command Prompt or PowerShell. 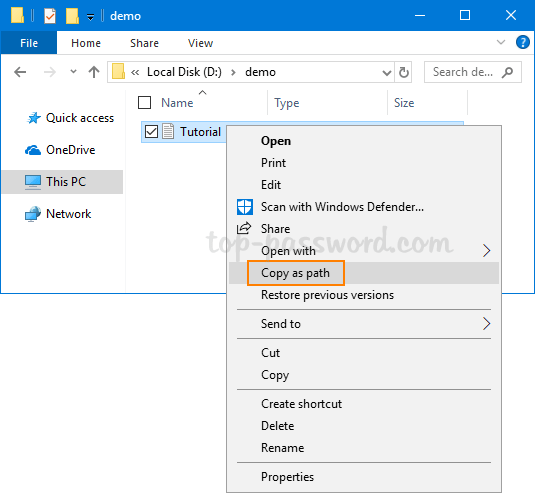 In this tutorial we’ll show you the fastest way to copy the full path of any folder or file in Windows 10 / 8 / 7. Open Windows Explorer and navigate to the files or folders whose path you want to copy. Once you are there, hold the SHIFT key and right-click the desired folders/files, then select “Copy as path” from the context menu. Next, you can paste the full location of the selected folders/files anywhere including NotePad, Command Prompt or PowerShell. That’s it! Hope you found this tip useful. Let’s know your comments. 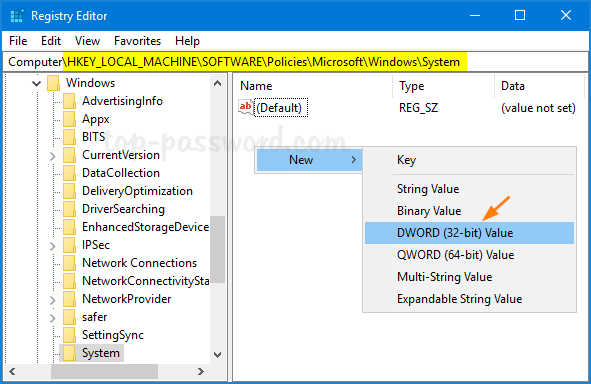 Is there a way to keep track of all encrypted files in Windows 10? When you forgot where you put your EFS encrypted files on your hard drive, here is a quick way to find them. Open an elevated Command Prompt or PowerShell. Run the following command. It will search all your local hard drives and list any EFS encrypted files it finds. When it’s done, you can open the MyEncryptedFiles.txt file created on your desktop, which contains all your encrypted files with the location.